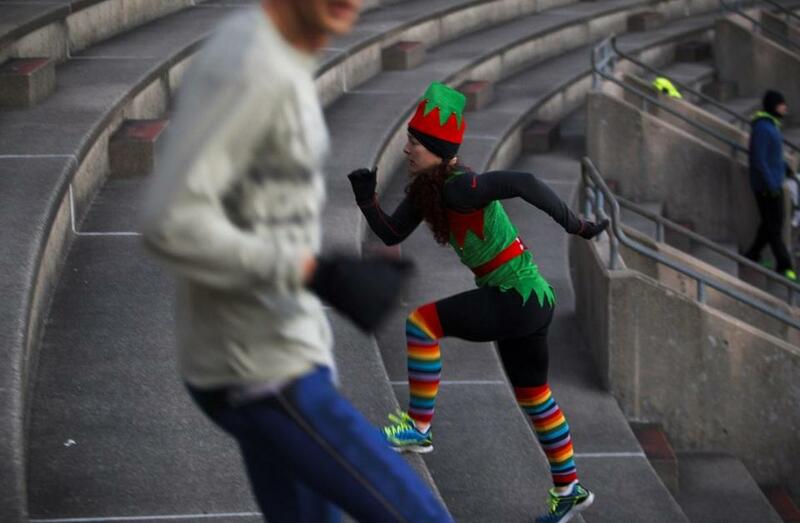 Emily Saul of Belmont joined the dozens who ran the Harvard Stadium steps on Christmas morning as part of the November Project. BY THE 10th anniversary of Facebook, it’s become almost a cliche to talk of social media as putting distance between people: It’s made face-to-face interaction obsolete, or so the argument goes. But explain then how, in the dark of morning, with temperatures hovering at 8 degrees, amid a declared snow emergency, a group of 200 people — mostly 20-somethings, many carrying shovels in hand — are racing up and down Parker Hill Avenue on Mission Hill. The runners, delirious with endorphins, camaraderie, and a cultish dedication, glide uphill with beaming smiles, as their charismatic leader, Brogran Graham, runs alongside them barking encouraging commands. This is the November Project, founded here in Boston in 2011 by two Northeastern University students who met while rowing for the crew team, and vowed to continue their rigorous training schedule after graduation. They did that through the month of November, and then well beyond. Slowly, as word spread online, others joined. First a couple, then dozens, then hundreds. Today the November Project is in 10 cities with more than 1,200 participants. It’s a phenomenon whose very success is a result of the social media tools that empower it. Drawing on Boston’s roots as a runner’s town, and the growing population of young people looking for something to do, it is the perfect harmony of Facebook meets boot camp. Often, the next day’s workout location is only revealed on Twitter. It draws all sorts — people like former Boston Bruin Andrew Ference, who returned last year to his hometown of Edmonton to join the Oilers and actually started his own chapter. But it’s not just athletes getting involved. It’s more people like 28-year-old Ceceilia Allwein, who came here from Fort Wayne, Ind., to attend the New England Conservatory of Music. After graduating, she wanted to meet new people, but running along the Charles wasn’t exactly social. She spent weeks monitoring the November Project Twitter feed before deciding to join. When she showed up, she found what she calls “the most enthusiastic people I’ve ever met in my life.” After that she was hooked. If she ever leaves Boston, she says, she will choose a city listed on the November Project website. Yet Brogan, whose day job is in marketing at New Balance, isn’t worried about people showing up. In fact, he tells emerging chapters not to join if they can’t hack the hours, the weather, or hugging strangers. He sees his model more like that of Tyler Durden’s, the alpha-male character in the movie “Fight Club,” whose antics and mayhem launched secret clubs across the country with countless adventure-craving members breaking out of their ordinary life to be part of something bigger. Some of that spirit has even caused a complaint or two with Brookline residents calling on police to enforce the noise ordinance — oh, Brookline. What draws thousands of strangers to spray paint their clothing and tattoo their bodies with November Project logos, and wake up before dawn to sprint up hills in the rain, sleet, and snow? It’s a good question, and one I asked MIT Sloan School of Management professor Thomas W. Malone, the founding director of the Center for Collective Intelligence. He studies how the power of the Internet allows for the emergence of a collective intelligence otherwise unavailable — like Wikipedia. He’s right; it is a big deal. But not because it made a city that loves running alone, run together. And not even because its existence is made possible by that intersection of community and technology that is forcing us to rethink social organizations. It’s a big deal because it makes Boston stronger. This is a city that draws people from around the world, where they meet, plan, dream, and innovate. November Project is yet another example of something fresh and new. Like Facebook itself, it gets scaled, and exported. But unlike Facebook, it stays here, as well. Urbanists call it “stickiness” — that extra thing that draws people in and makes it harder to leave.